Imagine it's the days of the California Gold Rush. Despite the lofty name given the period, times are tough. Gold is hard to find, and you went into debt to buy the things you needed to try to strike it rich. Food isn't abundant in the winter. In fact, you may be totally out of winter provisions. You might also be feeling tired and sickly. Then the first spring rains come, and you learn from a native friend that there's a cure for your winter ailments: A common, abundant weed that will make you feel better and fill your stomach. Today that weed is commonly called Miner's Lettuce, because so many gold miners cherished it as a way to prevent scurvy. It's got lots of vitamin C, and is one of late winter and early spring's first wild offerings. Most often, it's eaten raw, as in a salad, but it can be cooked like spinach, too, and tastes similar to that green. Common miner's lettuce's lily pad shaped leaf is easy to spot. Courtesy of Wikimedia and Franco Folini. There are two main types of Miner's Lettuce in the United States. 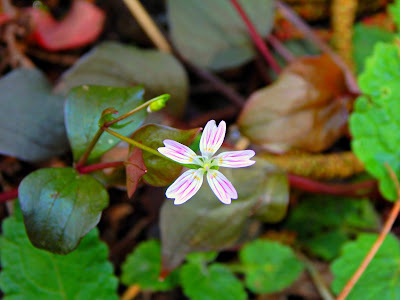 The most common, if foraging guidebooks are to be believed, is called simply "Miner's Lettuce." According to most sources, it's not native to this continent, but is believed to have been introduced to North America from Europe in 1794. It's sometimes called Indian lettuce, Cuban lettuce, winter purslane, miner's green, spring beauty, or it's Latin name, Claytonia perfoliata. It grows primarily in western North America, especially in coastal or mountainous regions, from Alaska and British Columbia down through Arizona and Central America. It can also be found in the interior western states. It tends to grow in great patches and has distinctively round, lily pad like leaves. This plant loves moist areas and tends to grow abundantly from late winter to mid-spring, notably in shady, wooded areas. It particularly loves disturbed areas of soil, especially if the area has recently seen fire. Before blooming. Courtesy of Wikimedia and Rob Hille. 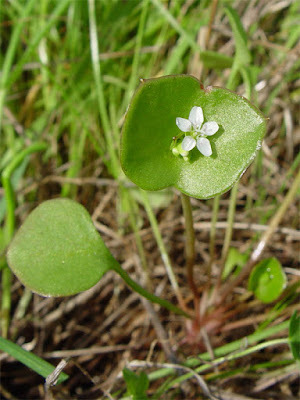 Miner's lettuce grows in a rosette, up to about 15 inches high. Usually the leaves are green, but the first young leaves may be purple or even brown-green. The mature leaves have very long stems - up to about 8 inches long. The five petaled flowers are pink or white and 3/4 - 1 1/2 inches long, appearing from about February through June. Courtesy of Wikimedia and Rob Hille. More rare purple miner's lettuce. Courtesy of Wikimedia and Jason Hollinger. 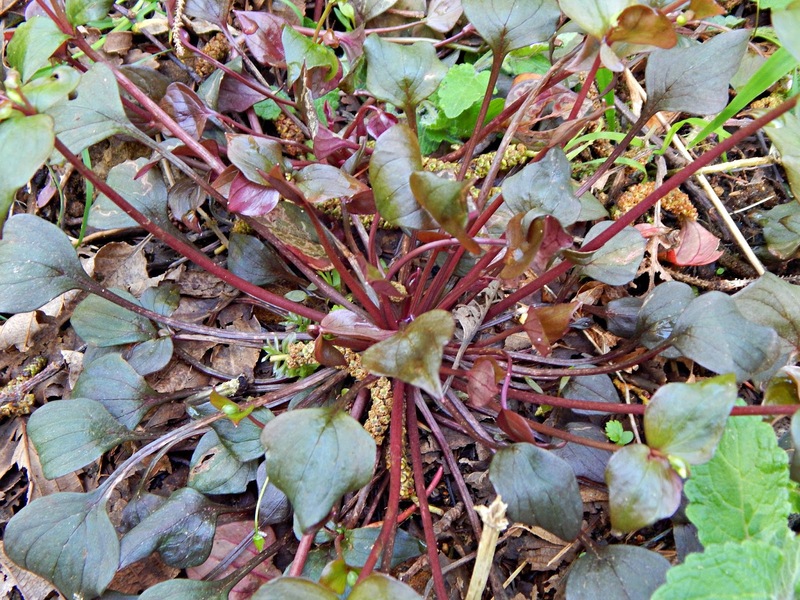 Our Siberian miner's lettuce starts purple and slowly turns green with time. 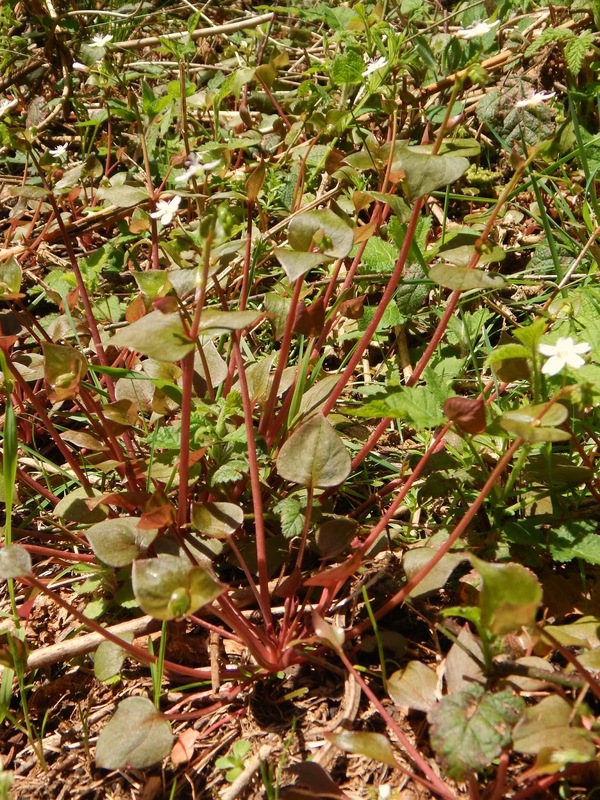 The second type of miner's lettuce is commonly called "Siberian Miner's Lettuce," or sometimes Siberian spring beauty, Western spring beauty, candy flower, pink purslane, or it's Latin name, Montia sibirica. It's native to both Siberia, and according to some sources, North America. (Other sources have the plant introduced to North America in the 18th century.) It grows over much of western North America, including Alaska down to British Columbia, down to California and Montana, and then west to Utah. 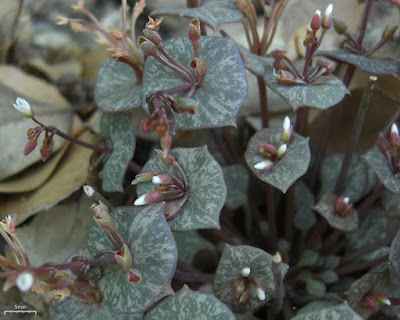 This plant is quite different in appearance from the other type of miner's lettuce. It's leaves and stems are lanceolate (almost heart shaped), succulent, thick, and about 2/5 - 2 inches wide. Early leaves can be purple, but more mature leaves are green. They grow in a basal rosette. The plant has 3 - 8 inch flowers with five pink, white, or pink and white striped petals. It usually flowers between February and August. It's stems grow about 4 - 14 inches high. Like common miner's lettuce, Siberian miner's lettuce often grows in patches, though I've also found single plants in our forest. You're most likely to see Siberian miner's lettuce in moist woods. Close up of a Siberian miner's lettuce leaf. Growth habit of Siberian miner's lettuce. A clump of Siberian miner's lettuce. According to foraging expert Hank Shaw, The Journal of the American Dietetic Association says that every 100 grams of miner's lettuce (about as much as you'd use in a salad) contains 33.3% of the daily recommendation for vitamin C, 22% the vitamin A, and 10% of the iron. 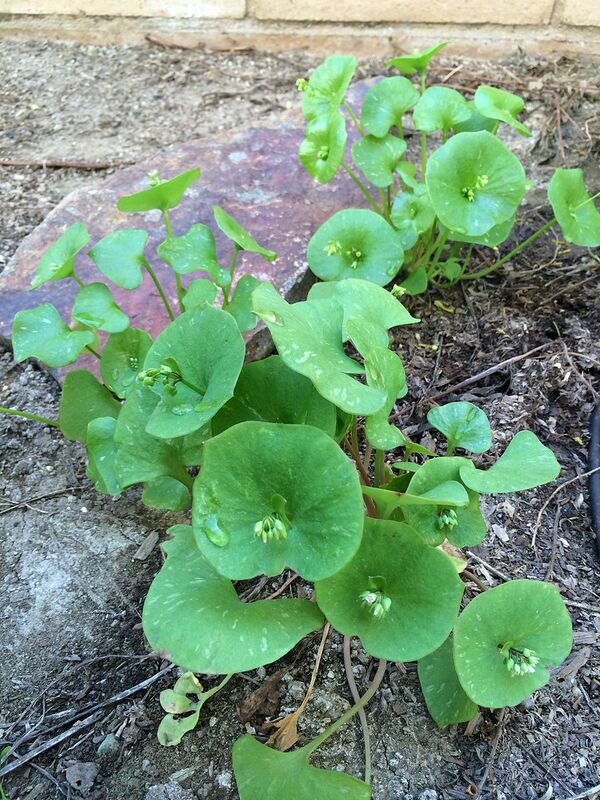 Herbalists say miner's lettuce cleanses the body. It's high in chlorophyll and antioxidants, which may back up their claim. This wild green is also said to contain Oega-3 fatty acids, although I could find no scientific papers to back up this claim. To harvest, cut the stems off near the soil, or cut off the leaves only. Young leaves taste best and have the best nutrition. Once the plant flowers, the leaves may taste more tangy. Older leaves, or plants growing in the sun, can taste bitter. Usually the flowers - only fresh ones - are left on the leaves and added to salads. Harvest responsibly. Leave plenty of the plant behind, so wildlife can reap its benefits, and so the plant will continue to thrive and spread. If you don't have miner's lettuce nearby, you can now buy seeds for it! Both Territorial Seed Company and Baker Creek Heirloom Seeds carry common miner's lettuce seeds. You can even buy common miner's lettuce seeds on Amazon! Just remember that like most wild plants, if given a setting they like, miner's lettuce will spread. So consider planting it in a container, and make sure you remove flowers before they go to seed.